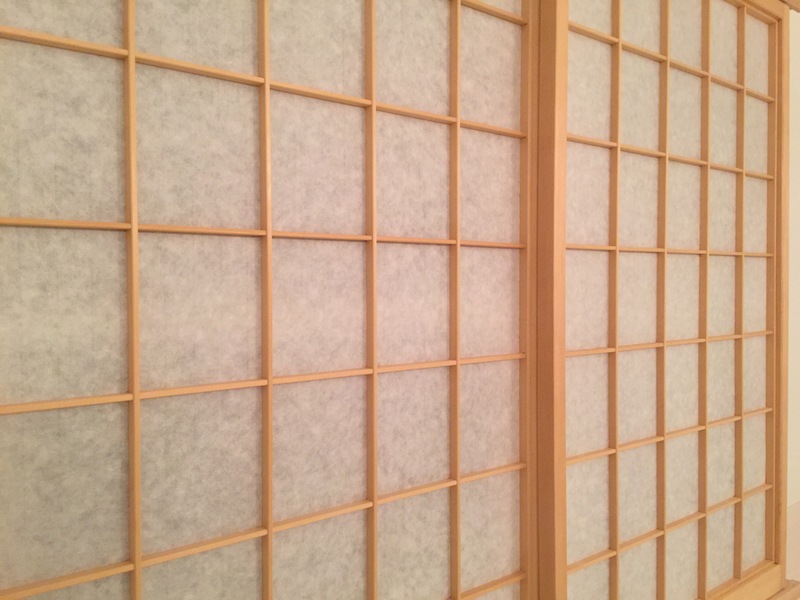 Hello and welcome to my blog, in today’s post I will detail the making of shoji screens to cover a bathroom window. 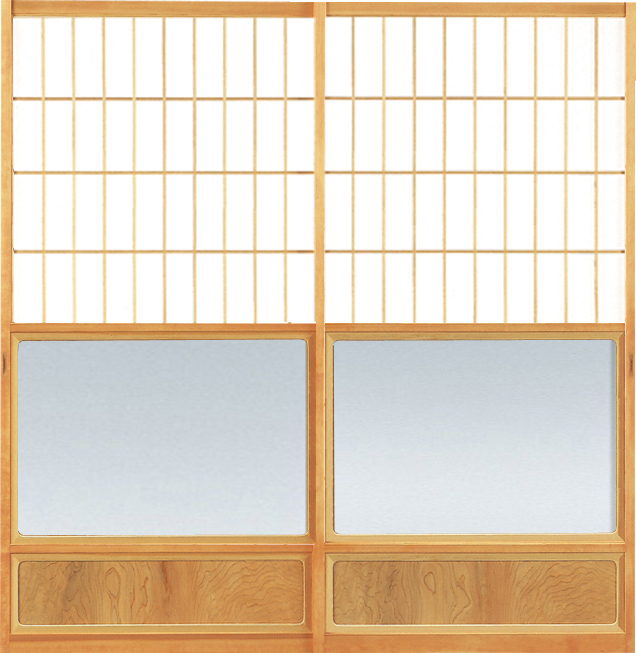 Shoji are sliding doors, windows and room dividers of traditional Japanese architecture, they consist of a wooden frame and lattice work backed by washi paper. Shoji, when backlit, allow a soft diffuse light to enter a room. I’ve taken an increasing interest in traditional Japanese interiors that has grown along with my interest in woodwork and Japanese tools. Japanese traditional interiors feature a masterful balance of rationally designed formal elements working harmoniously with natural elements such as peeled posts and freeform timbers. A similar balance is struck in surface finishes, where the fine polish left by the hand plane is contrasted to the wavy texture imparted by the spear plane and to the rough hewn scallops of the broad axe and the adze. Shoji are a very prominent feature of traditional Japanese interiors and possibly the first feature that comes to mind for so many when they think of traditional Japanese interior woodwork. Shoji, in my opinion, are easily adopted to use outside of traditional interior work. Here I will use them in my otherwise contemporary American interior. The materials used in shoji vary greatly, but traditionally they were made of high quality softwoods such as Hinoki cypress. Densely grown softwoods allow shoji to be light yet strong. Traditionally, shoji are finished with a hand plane and without oil or film finishes. High quality softwoods take a on beautifully smooth and highly polished surface when cut with a hand plane. That surface repels water and resists taking on dirt, it also cleans with ease and never requires reapplication of film finish. The materials used in shoji can now include western red cedar, Alaskan yellow cedar, Port Orford cedar and Douglas-fir amongst other woods available in America. It is the job of the maker to ensure that quality materials, those which would live up to hinoki cypress, are utilized. I’ve decided to use Alaskan yellow cedar for this build. After taking many shavings in preparation for NYC KEZ, I could not help but desire to build using that same material. This material grows very slowly and so it has an incredibly tight grain structure allowing it to work very nicely with sharp tools. After cutting the cedar into a vertical grain orientation I begin preparing for the mortise and tenon joinery which will connect the outside corners. Shoji are made of a joined construction using twin mortise and tenon joints at each corner to strengthen their light frame. These twin tenons each feature a haunch and a jaguchi joint. The jaguchi joint is a mitered shoulder made to receive the chamfered interior edge of the stile. Once the tenons are marked out I make rip cuts along the scored lines, carefully leaving the line in tact. This is followed by cross cutting the shoulders and haunches, then coping out the waste between the tenons. The surface between the two tenons is then pared flat. Finally the waste between the jaguchi and the tenon is pared flat and the tenons are chamfered. Next the stiles are prepared, seen here I am chamfering the interior edges. Then cutting the twin mortises. The resulting joint, clamped up in a test fit. Test fitting is not looked highly upon in traditional Japanese work, but working alone in my shop no one is there to mind. The process is repeated seven times to complete the frame. Next begins making the interior lattice work known as kumiko. Kumiko are made from material which is cut very thin, because of this their grain orientation is absolutely critical and they must be made from clear vertical grain material. After they’re cut to size and roughly thicknessed they are then planed to exact thickness and chamfered along their edges. Next the kumiko are fitted into their respective frames to ensure that the assembled lattice work will fit snugly. Shown here I am trimming the pieces to length. The kumiko lattice work is first joined together utilizing half-lap joints and then joined to a framework known as tsukeko with many small mortise and tenon joints. Here I am cutting the half lap joints. The kumiko are ganged up and clamped, then marked and cut all at once. Next I zip out the waste with a long paring chisel. Finally the ends are cut into tenons. These tenons will join into mortises cut into the interior frame known as the tsukeko. Here I am using a traditional Japanese Jorgensen clamp to keep the material tightly bound together. The interior frame, which holds the kumiko in place, is joined at its four corners using a mitered mortise and tenon joints. I start by cutting the tenons first, then paring their shoulders for a clean fit. Next the receiving mortise is pared followed by test fitting in the frame. The many mortises along the tsukeko are cut next, and finally the kumiko can be assembled as a unit. Next, the final step before assembly, is to cut a rabbet into the top and bottom rails. This rabbet will allow the frame to be fitted into a track upon which the shoji will sit. The shoji are assembled, and once the glue sets the stiles can be trimmed to match the adjoining rails. The stiles are left proud, the extending horns are used to adjust the shoji frames once they are seated in their tracks. After the horns are sawn, they are pared flush to the rabbet. Shoji are traditionally backed with a type of washi paper known as Kozo. Kozo paper is made from the bark of the mulberry bush. I’m using handmade kozo paper for these shoji, the handmade variety of kozo paper shows a very subtle texture. This subtle texture imparts some interest into the otherwise plain looking white background of the shoji panels. I begin applying the shoji paper by laying a sheet on the panel and taping the edges. I leave the top an bottom edges long so that the area effected by the tape can be cut off leaving a clean edge. Next I trim the paper to width using a knife. I will use pre-made rice glue to apply the kozo paper. The rice glue is applied to the lattice work. Then the paper attached to that. Once the glue has cured I cut off of the excess at the top and bottom of the panel. Finally my shoji are ready to diffuse light. I’ve created a framework to hold the shoji in place which replaced the sill and molding previously surrounding my window. I used white ash, a hardwood, to make the frame. White ash is surely not traditional, but I find it to compliment the alaskan yellow cedar of the shoji while offering balance to variety of light colored woods that are featured in the bathroom. Shown below are my tub and tile, otherwise known as lingering remnants of the 90’s. Still, some work remains in completing the frame, such as building stops, but the overall appearance will remain as such. I hope that you have enjoyed following along and I look forward to your comments. I owe a thank you to Desmond King for providing such incredible insight in your books on Shoji and Kumiko and through conversation, along with Stan Covington, Jim Blauvelt, Yann Giguere and Chris Hall amongst others who’ve helped me so much in preparing for and creating this work. While I work alone in my shop I never feel disconnected from this community which has helped to guide and inspire me. I loved the write up and you answered a question I had regarding when to chamfer the thru tenon. Traditional Japanese Jorgie’s 🙂 Thank you for sharing. Hi Paul, thanks for your comment! Hah, I can’t resist deploying my dry humor from time to time 🙂 Glad you found my post helpful. Thank you Tam, I think for many it seems to follow as they dive deeper into the depths of Japanese tools. It does also take some separation for notions such as finishing beyond that of what is provided by a hand plane and an enjoyment of the aesthetic. I’ll likely continue to add more traditional work to my repertoire as I find it very enjoyable. I like your proposal, in the interim I’ve submitted some of my work to magazines in order to gain a broader appeal. These turned out very nice Brian! A great write up as well. I do have a question though. How well do you think the paper and rice glue will hold up in the high heat and humidity of the bathroom? The burnishing effect of the plane should keep the wood stable, but I have concerns about the paper and glue. I ask because I have a similar project on my to-do list. Thanks Greg! I actually built these for the bathroom first as a sort of experiment, planning to test how well the rice paper and glue hold up to humidity. I’m sure they will do fine as I have an exhaust fan. I believe the traditional bath would have louvered type windows, but thats not really possible here with HVAC systems running basically year round, so I thought I’ll give this a shot. Worst case I will have to replace the paper with ‘outdoor’ paper. Please tell more about securing the paper to the lattice. The picture shows a lot of glue on the lattice. I take it that the paper is set down and not rolled on. Even then that means that the paper must not move in order to not smear and telegraph through on the translucent paper. How many people are involved? If only one person, how is that done? Does rice glue blend with the paper so that it cannot be detected? Hi Gary, After I tape the paper down and cut it to size, I then roll it back up and apply the glue to the lattice. Once the glue is applied I roll the paper back over the lattice and then work it with my fingers until I can feel that the glue has saturated the paper at all points along the lattice. I work alone, so I do this myself without help. The rice glue is applied in a way which does not promote squeeze out, but once it dries it also dries clear and cannot be readily detected. Popular is a good idea, nice and light, and easy to acquire in large and clear pieces. I’ve recently acquired old growth Western red cedar which I will be using for my next shoji project, a set of doors with hip panels. The Jaguchi is tough! Certainly a joint where muscle memory comes into play. It’s amazing to consider how quickly these screens are made by hand in Japan and how they must have that muscle memory to the point where zero paring is required. Great work Brian! Excellent plane work, and the twin tenon joints are yummy. Why didn’t you make full-blown mentori kumiko? Is that the next project? You should also give yukimi shoji with round internal corners a try, if you have a place to install them, that is. It is a deep but entertaining rabbit hole. Thank you Stan! Good to hear from you! I just realized now that none of my closeups show the chamfered edges well, so I added some photos after reading your comment. Round internal corners sound cool! I agree, this is quite the rabbit hole, I’ve really been wanting to do a waist panel of complicated kumiko pattern work, but not up to it just yet. The twin tenons are really impressively secure, I had these just dry assembled for about a month without the joints even separating during any sort of shuffling around the shop. At which point it became clear how well engineered these frames are. What you have made is a simpler version of mentori shoji. The more elegant version is worth trying. Kumiko zaiku is delicate. Be certain before you make a koshiita with it. Keep up trhe great work! Thank you Stan! If I recall correctly, you had mentioned a multiple cutter tool for this in the past which I believe is specifically made for this type of mentori shoji? The shoji I have in mind will be 80″ tall, so I have been interested in adding the koshiita to add some rigidity to the otherwise fairly tall panel. Also they’ll be installed as doors that will get regular use so that will help to prevent damage to the lower level paper. They appear to be made at 1/4 the overall height, is this accurate? Thank you for your insight as always! The tool is called a kudegoshi. There are two varieties, a one-piece chisel-blade like tool that will cut only one kind of mentori, and the block variety that combines different combinations of cutters in a wooden block to cut the joint. The block style is the only kind I have used. Mine was made by Yukichika, a famous Tokyo planemaker. This link shows the chisel-type. I assume they ride in a jig to ensure proper depth and straightness. Free-handing is unthinkable. Three blades are clamped into the block and used with a jig that includes a straight fence, with a cutout matching the dimensions of the blades of the kudegosh, for the kumiko to ride against, and a right-angle fence (sometimes two fences forming a chute) for the block to ride against. The block is then pushed into the kumiko cutting the notch to house the mentori chamfers. You can cut four or five kumiko at one time. I think you can see how the ability to change blades would be handy. Of course, you can make the same cut with a paring chisel and a 45 degree guide block. Typically not quite as clean, and certainly slower than a kudegoshi, but it works for a limited run. I suppose you could do it on a tablesaw if you made a sliding jig and were careful. 80″ is tall for a shoji. I have made a lot of these. You will definitely want a koshiita to stiffen thing up make them more durable, especially if shoes are worn around them. You should consider proportions and stability issues. Using thicker and wider stiles (tatekamachi) than is standard not only to improve stiffness, but improve the visual appearance since standard-size stiles will look very skinny at 80″. This is really more of a hikido than a shoji. They will feel heavy and clunky, not light and delicate like typical shoji in Japan. But that is OK if they are designed to work with the room’s interior dimensions. Have you considered using glass instead of paper? If these will be installed in front of windows, and will replace blinds or curtains, you might want to consider using two layers of kumiko with paper or glass sandwiched in between. This design is more compatible with modern, non-Japanese interiors and windows, and shows the kumiko lattice through the window, which is much more attractive than plain paper. This style of shoji is a lot more work, and requires somes tricks at the top rail, but I am sure you could handle them. This is also the style my customers in the US wanted when I was in the US. They are very expensive over here in Japan, starting at around $3,000/ea. Thank you for your detailed reply! Very much appreciated. They’re something I think I will add in as I progress in shoji, I suppose I could mark out and cut these in the same way that I do the jaguchi joint, but it does seem something that I would really want to setup the jig for before adding them to the line up. 80″ does seem large, so I cut them heavier than I did for the normal shoji. I left the stiles fairly heavy, they’ll finish up at about 35mm sq. I am just shooting from the hip on that measurement, but it seemed appropriate. I also made absolutely certain to acquire material which could be perfectly straight grained and rift sawn so these stiles so far are perfectly VG material. I’m amazed, honestly, that I was able to get perfect 80″ runs, but it came together. I had considered glass but ultimately eliminated it since I was concerned that it may be simply too heavy for these frames, I’d have to use at least 1/8″ glass plate, which at this dimension will add a lot of weight to the assembly. That is a nice idea to have kumiko both front and back, I don’t mind seeing just the paper from the exterior view, or in this case opposing room view, but I can see where the double kumiko would hold appeal. $3000 sounds right, especially if it is a complicated pattern. I’ve been debating a contrasting material for the kumiko, possibly using AYC for the kumiko and WRC for the frame. Excellent post Brian, shoji are indeed fun and addictive to make. And nice job on the jaguchi joint. I’ve never attempted that and I imagine it is a difficult one to get right. I’m curious, did you rip all of the kumiko strips by hand? Thanks Jon! Good to hear from you. The jaguchi joint seemed daunting but when working to knife marks it was not bad. I have a festool track saw, so I broke down the 2x material into 1/4″ strips with that, then ripped them down into their respective width by hand. I was also toying with the idea of Port Orford or Alaskan Yellow Cedar. I will need to find a good resource out here in the SF Bay area. I don’t believe Macbeaths carries it. Not sure. Hi Joe, Good to hear from you! Hah, take it slowly and you’ll be fine. Most projects can be broken down into small parts which make the whole, working on them until success individually will help put your mind at ease while you approach each piece. Not sure on the lumber, because I’m in NJ, but I’m certain that you have access to absolutely incredible lumber being on the west coast. Thanks for the info. I have the chamfer plane – same model as yours. I don’t think there are too many different styles of them. I have a quick question though. What do you do to the parts of the fences where the blade impacts them? Seems like there needs to be a groove of some kind cut into them that allows the blade to extend, however slightly, beneath the bottom of the dai. Is that the case? Did you cut one inn advance? The oak seems a bit too hard to allow it to just happen as you advance the blade. Let me know? Much appreciated Brian. Good question, mine has actually worn a tiny groove from advancing the blade. It’s never given me trouble in cutting, so truthfully I’ve never investigated further. I can’t see a tiny groove having a negative impact. Commenting on the points in your response. Yes you can make the small 45 degree cuts to the mentori kumiko like the jaguchi, but I think a saw would be risky since cutting even a little too deep would weaken the thin kumiko. 3 chisel cuts is a better approach, but once again, you must be very careful not to cut too deep. This is why the kudegoshi is such a valuable tool for the professional tategushi. VG 84″ long? Amazing. Must have been expensive wood. Mixing varieties of wood is something done occasionally. It has classical precendence. The examples I have seen have used a lighter-colored wood, such as Yoshino sugi, for the frame and koshiitia, and a darker wood for the kumiko. I think a strong color contrast is necessary for it to look intentional. I did it once in doctor’s house in Salt Lake City. His wife wanted lacquered kumiko, but I could not do that, so they settled for very dark Black Walnut kumiko in a double-layer Chinese motiff pattern. The shoji (12 in the set?) went inside a long sliding glass door wall at the rear patio overlooking the pool. I recall that job paid well. With big shoji, as I mentioned in my previous comments, they become heavy and more like sliding doors. If you use glass (I highly recommend you give glass frosted with an etched pattern i.e. sparrows and bamboo, a try), the tracks will wear quickly, so small wheels on a half-round metal track are a better, classic, solution. I can send you some if you want to give them a try. The double kumiko shoji are great, and work well with paper, plastic, or glass. Indeed, it is the only attractive option when you use fireproof plastic panels (required by fire code in many commercial applications), or glass instead of paper. The first kumiko lattice panel is fixed to the kamachi, and the second panel can either be held in place with small screws, or slid down into dado’s in the stile’s side through a split top rail. The most elegant solution is to have a removable top rail that allows the glass and kumiko to drop into the dado’s. This top rail is joined without glue using a self-locking kama-hozo. The sickle shaped chisel I sent you is specifically designed for this joint. This is pretty advanced stuff…. Thank you for your detailed reply! I’ll remain pursuant of true mentori kumiko, but likely wait until I can afford to invest in a good kudegoshi before making them, I can see where tiny errors would weaken the kumiko badly. Quite true, around here quality softwoods are the same or more expensive than quality hardwoods. I’m sure the same is true elsewhere but I suppose it took me by surprise when I first started buying them. It’s comes as an especially large surprise to many used to seeing those “same” woods at the local big box store for $10/stick. Unfortunately tiny growth rings and fine grain come at a huge premium. I passed, recently, on an exception wide piece of perfectly VG douglas fir not having a purpose for it at the time only to find out exactly how rare such a material is not soon after. I’ve come to appreciate VG material more than anything as it seems exceptionally rare in large pieces. Darker kumiko in a lighter panel is a nice aesthetic. I don’t know why that did not come to mind for me initially, but with a bit of research I see that is the case for kumiko and also for panels. The shoji you’ve made for the doctor’s house sounds beautiful. Is the Chinese pattern that you used the pattern of what appears to be many interlocking ‘T’ shapes? Found in Ming dynasty furniture and screens? I may have to do a test pilot in that pattern for the house, as it would be exceptionally popular with my wife and her friends. Thank you for offering to send a set of wheels, I may take you up on that as I’m certain that as I progress I will get the request for wheels on a track, especially in commercial applications in addition to those with glass panels. Thank you for detailing the glass panel install. That is what initially came to mind for me (screws). The self-locking kama-hozo sounds pretty slick, that approach would be hard for me to resist, having some resistance to showing screws. Thanks again for the ideas, I am beginning to understand shoji as a basic framework for a body of work that allows so much individual creativity to solve problems that pop up in modern application. Thanks again for sending the sickle shaped chisel, it may be getting put to good use sooner than expected. Brian: I’m a new follower of your site and you are truly an inspiration. I too work alone in my small NJ shop and look forward to the mindfulness of this kind of precise joinery. One question – can you recommend some good local sources for the various types of woods you typically use? I look forward to reading and seeing more of your work. Hi Tim, Thank you for your positive comments and for following my site! Great to hear from another NJ woodworker. For the softwoods I use Boro Lumber, they’re a commercial yard so I call ahead with orders which usually take 5 days for them to pull. For Alaskan yellow cedar they’re ‘the’ source as I’ve yet to find another. They’re also very reasonable on pricing and do not have a minimum order (that I’m aware of). They’re geared toward large orders so they can pick and mill for you, but I have simply asked them to pick and allow me to do my own ‘milling’ so to speak and they’re fine with that. For hardwoods and some fine softwoods (Western red cedar) I use Willard Brothers, they’re good people and I’ve been buying from them for 15 years. I also buy from Mike Quinn in PA, he carry’s some stuff that is just plain incredible including or otherwise hard to find such as Honduran Mahogany in 20″ wide 8/4 slabs, clear walnut, and 4/4 slabs which I almost never see outside of his yard. Mike is a sawyer and does fine work. I’ve got 17″ wide 4/4 through cut walnut from him that is tight and clear grained over 8′, it is flat and without noticeable twist. He uses a dehumidifier kiln and the wood retains beautiful color. Your humor is so sparse and dry that I read right past the traditional Japanese Jorgensens by half a sentence before it hit! Haha, good eye on catching that one. Thanks for your thoughtful comment, very much appreciated. I spend much time pouring over design ahead of anything else, so I’m very glad to see when someone picks up on my efforts. I’m also very much a fan of modern design, along with a few other movements. My path was similar in that a passion for modern architecture and Japanese tools along with an interest in woodworking eventually brought me close to Japanese design, and we’re in good company with a great many modern architects finding influence in Japanese architecture. That sounds like a nice project, but also a pretty big project. You may want to first start with a small traditional shoji and it will clarify some of the details of making them. They’re carefully engineered, change one small thing and it creates a chain reaction of other changes being required. Rather than use barn door hardware, check out Len Brackett’s book he details rollers and tracks for heavier large shoji. Having kumiko on both sides is possible but requires heavier rails and stiles. Traditionally the paper side will face the passageway or exterior and the kumiko will face into the room.